Even in this era of compliance, compliance, compliance, the most important job of an HR professional is to make a good hire. The right hire for the job leads to a good employee. In order to make the right choice, you need to know the truth about your applicants. Applicants, at the same time, have an intense incentive to present themselves in the best light possible, sometimes leading them to shade the truth a bit. Recognizing these lies—some of them little white lies, others whoppers—is not always easy, especially if the background information you need to uncover them is missing or just very hard to get. Like other kinds of fraud, resume fraud is a hidden threat, intentionally veiled by applicants to increase their chances of being hired. To combat this fraud, hiring managers need to understand why people lie on resumes and how to identify these characteristics in applicants. There is probably no foolproof way to find the lies in every application, but it will help to know more about the kind of people who cheat. A recent article published by CNBC summarized some research on resume fraud, noting that people who lie on an application have often been unemployed for a long time and are motivated by jealousy or envy of the people who have found work. The most important point is that the liars tend to be people who have lied before, or committed other acts that deviate from norms of honesty and trust. The source of the CNBC piece is a SHRM-funded research project headed by Brian Dineen, Christine Henle, and Michelle Duffy. These authors surveyed 369 unemployed job seekers, 272 recruiters, and 51 Masters Students who were engaged in job searches to identify patterns of resume fraud. 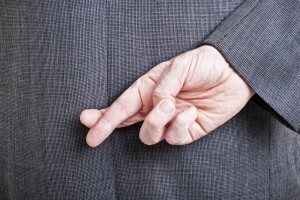 Resume fraudsters often have a pattern of lying or cheating over time. They have “lower levels of moral identity” and histories of deviant behavior. People who lie on resumes get more job interviews. If they are not detected, then by the numbers they are more likely to get a job than honest candidates. Fraudsters may make social comparisons with others who get or have jobs, and feel entitled to cheat to make up for a perceived slight. This envy can serve as a justification for the fraudulent behavior. Hiring managers sometimes misunderstand why people lie on resumes. They may forgive some discrepancies in the belief that applicants are suffering in a very competitive job market, and exaggerated the facts inadvertently or with the best of intentions. Unfortunately, this can lead to rewarding the fraudster with a job, taking the deviant behavior inside the workplace. There are some tactics employers can use to try to uncover resume lies, and to reveal a history of deviant behavior. While not perfect, these tactics can help to mitigate the hiring risks from resume fraud. Perform a thorough background check. The first implication for hiring best practices listed in the Dineen study summary is that “background verification services are essential.” Most employers use some form of background screening, but this process needs to be as comprehensive as possible for the job in question. Sad experience shows that fraud occurs at all levels in an organization, so the process needs to be taken seriously across the entire organization. If any indication of deviant behavior emerges, follow up is essential. Do a critical review of the resume. Lies on resumes or applications can sometimes be detected by noting potential discrepancies or omissions. For example, if an employment history timeline omits specific beginning and ending dates, look deeper. If there are gaps, find out specifically why. If someone’s accomplishments seem too good to be true, maybe they are: ask about it. Prepare and follow an interview script. Skilled liars can take over an interview; don’t let them. Ask your probing questions about resume claims, and persist until you get an answer you can check independently. Good character makes people good employees—and good friends, good spouses, and good co-workers. Knowing a person’s character is not always easy to discover, but it is the most important single thing you need to know before you hire.